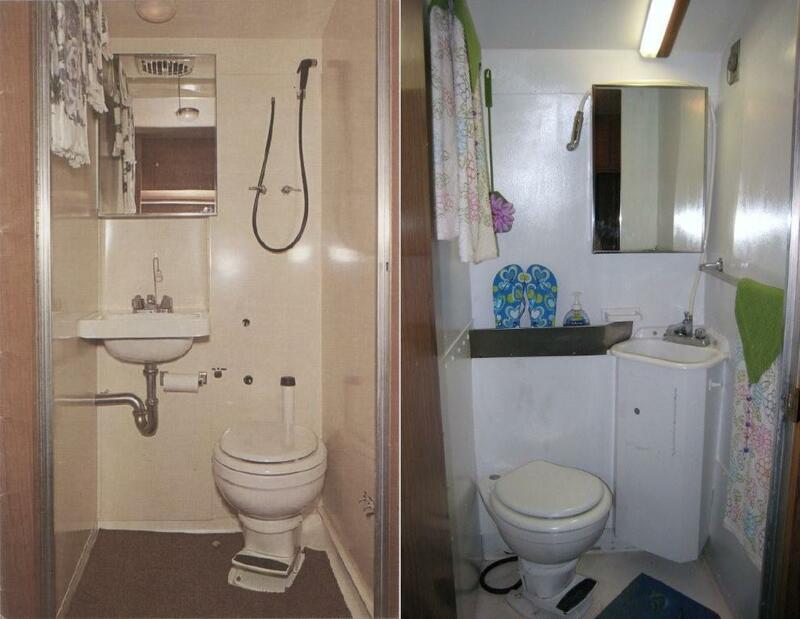 The Ultra Van is equipped with a small bathroom located curbside, between the kitchen and the bedroom. It contains a small sink, a flush toilet, a handheld sprayer for showering, a mirror-door medicine cabinet, a 12v light, and a vented skylight with electric fan. 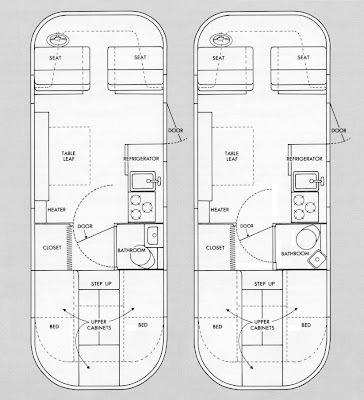 As in most such efficient RVs, there is no separate bathing area - instead the entire room is waterproofed (known as a "wet bathroom"). The bathroom door is cleverly fitted so that it can be swung open and latched onto the far side of the hallway - making the bedroom area completely private from the living area of the coach and forming a small dressing area. The bathroom design was changed in 1968. 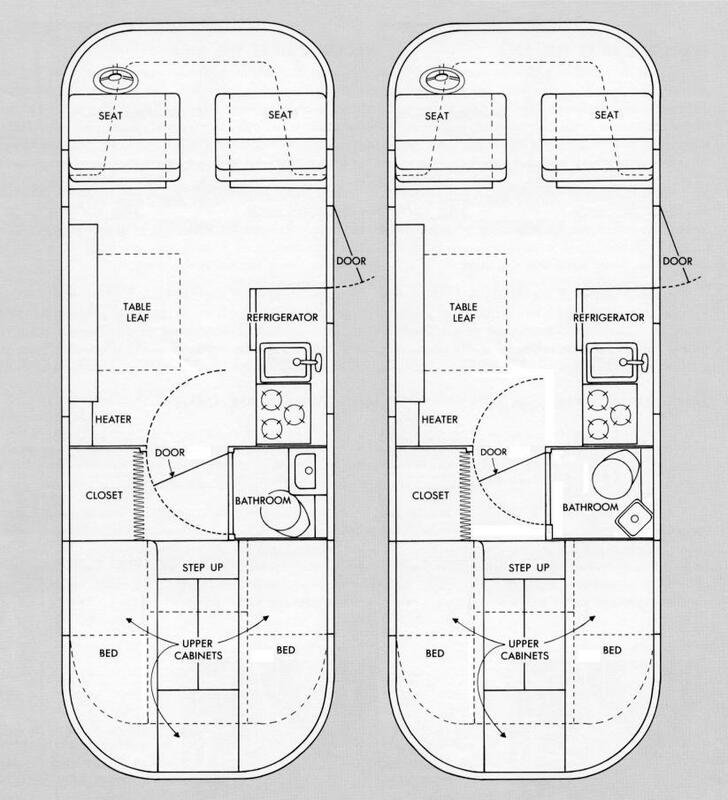 Some differences are fairly obvious; the later bathroom (coach #411 and up) is slightly larger than the earlier version, the later sink is a smaller corner unit, and the toilet and sink positions were reversed. Since the bathroom was expanded towards the center of the coach, the resulting hallway is 5 inches narrower - forcing the bathroom door to be cut down 5 inches to fit. Less obvious are the major changes to the coach that were the real reason behind the redesign. To reduce weight, the coach was originally equipped with a greywater system which uses recycled shower and sink drainwater instead of fresh potable water for toilet flushing. This reduces the total demand for fresh water - allowing for smaller 30 gallon tanks. However, to make all this work required a total of five electric pumps - including one mounted in the base of the toilet to pump the waste into the holding tank. This particular "Ultra Pump" (more commonly known these days as a macerator pump) demanded regular maintenance, or subsequent messy and unpleasant repair. In order to eliminate this issue, the toilet was moved forward to a position directly over the holding tank, the greywater system was eliminated, the tanks were expanded to 50 gallons, and three of the pumps were removed. The Ultra Van is a small class A motorhome that features a rear engine, four wheel independent suspension, and streamlined aluminum unibody construction. It was developed by retired aircraft designer Dave Peterson in 1960. Limited production took place in Oakland California, with the majority of the coaches rolling out of the factory doors in Hutchinson Kansas between 1966 and 1970. 375 Ultra Vans were built - most of them powered by the aircooled Chevrolet Corvair engine. 48 of them were powered by the small-block Chevrolet 307 cubic inch V8 engine, and 8 were of other configurations.